For dinner, my childhood friend’s father asked my sister and I what we haven’t tried yet in Japan. We only had sushi from the market. For us, sushi from the market was already fresh and better than the ones back at home, but it wasn’t exactly restaurant-quality sushi… So, they took us to a restaurant near Kobe Harborland for the real experience, with sushi and sashimi! 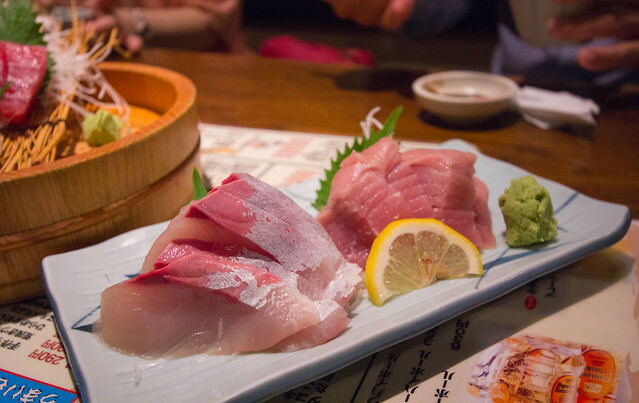 We started off with sashimi, which is thin slices of fish served with wasabi. It is also usually the first course in a (formal) Japanese meal. We had a lot of TUNA! 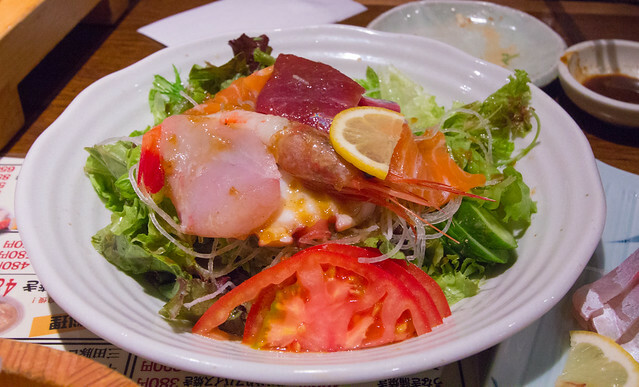 We also had salad with assorted fish! 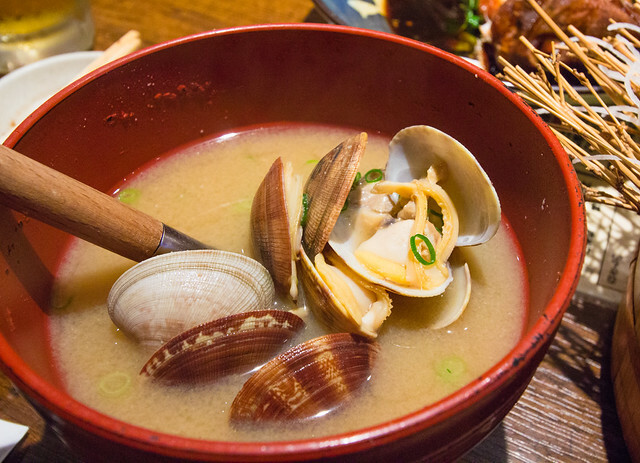 And last but not least, clam miso soup! Our dinner was delicious with very fresh tuna and clams….yummm! We noticed that the type, quality, and cost of fish varies around the world. In California, fresh salmon can be easily found in many markets while tuna is on the pricier side. 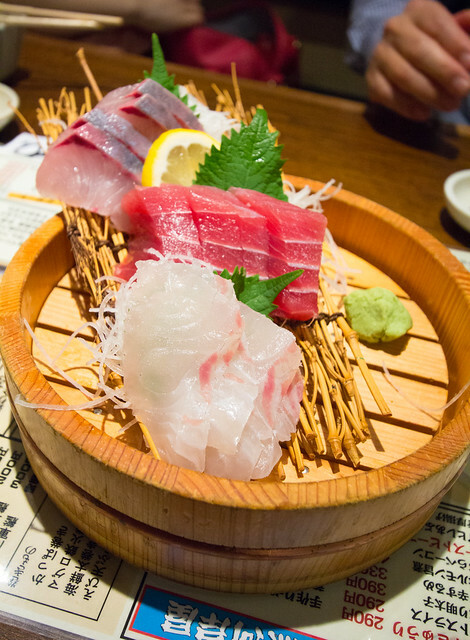 In Japan, fresh tuna is found everywhere from convenience stores to markets to restaurants. Salmon tends to be more expensive in Japan and not as fresh as in California. Wasabi is also different in Japan and California. In Japan, they use fresh ground wasabi. Outside of Japan, they tend to use a mixture of horseradish, mustard, and food coloring, which is also thicker and stronger than fresh wasabi. 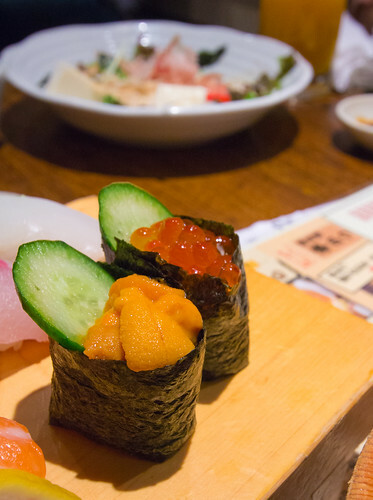 Also, in Japan, for sushi, wasabi is usually placed in between the rice and fish. You take the fish off the rice and dip in the soy sauce, place back on the rice and eat it. This method won’t break the rice apart when you eat the sushi. 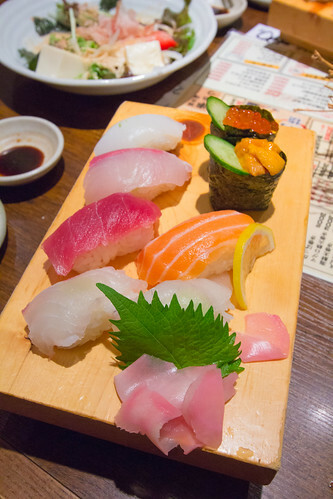 Definitely do not skip a meal (or two) with sushi and sashimi at a restaurant in Japan! !